What, you ask, is Hugelkultur? Think of it as very slow composting. 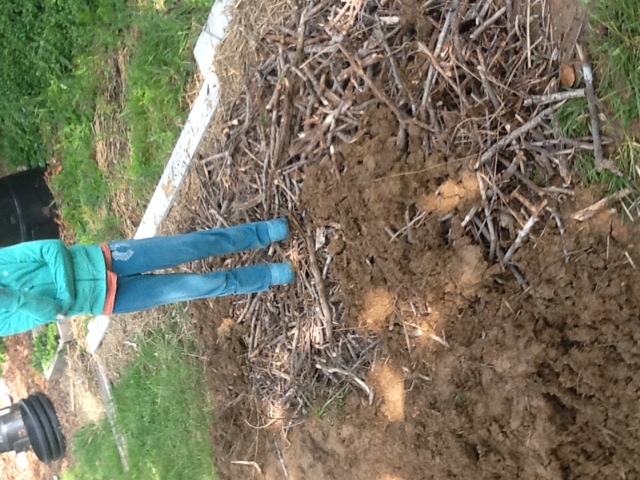 Hugelkulture is the practice of composting large woody material to create a raised garden bed. It is a way of dealing with excess amounts of woody garden wastes, for example prunings, hedge clippings, brassica stems, or brashwood. The name comes from German – hügelkultur translates as “hill culture”. The technique involves digging a circular trench about 1′ (30 cm) deep and 5′ (1.5 m) wide, in the centre of which is dug another hole 1′ (30 cm) deep hole. The material is piled in. 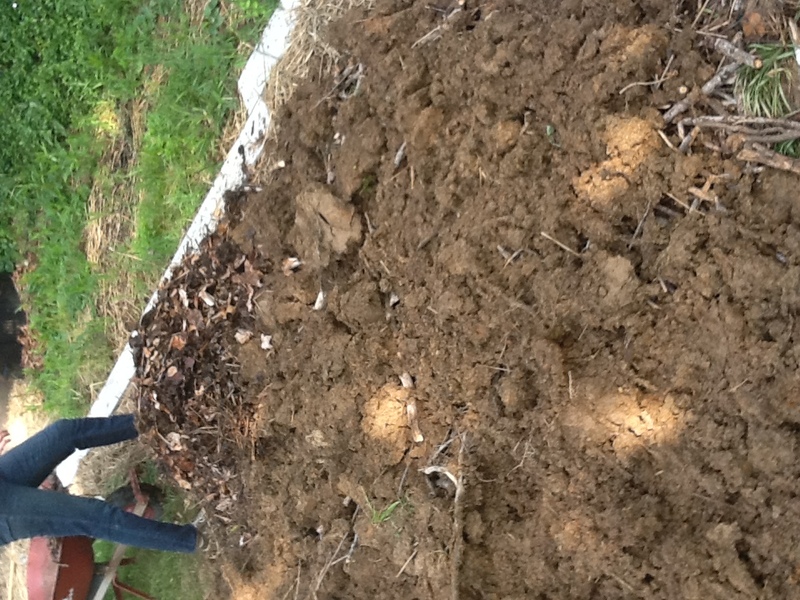 Turf (grass) is then stacked face down on top, then layers of compost, well rotted leaves and manure, etc as available. The layers break down slowly and creating rich humus over four or five years. It is claimed that this is ideal for growing hungry crops such as zucchinis (courgettes) or strawberries. As the years pass, the deep soil of the raised bed becomes incredibly rich and loaded with soil life. As the wood shrinks, it makes more tiny air pockets – so your hugelkultur becomes self tilling. 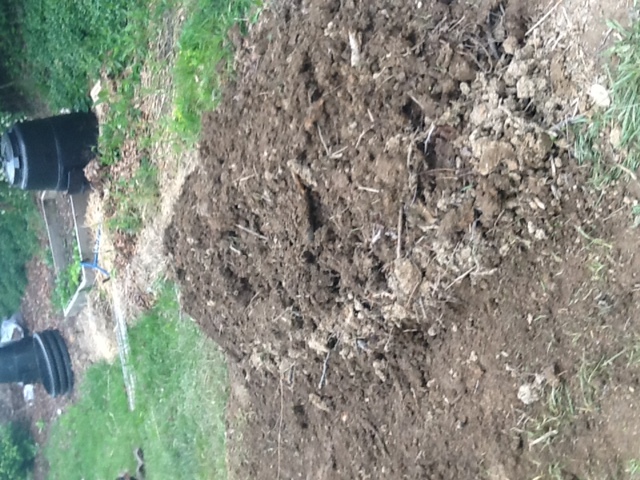 The first few years, the composting process will slightly warm the soil giving a slightly longer growing season, in temperate and cold climates. We dug out what looked like a large grave which soon filled with water. For a week or so the girls would say things like “can we go play in the grave?” to creepy effect. (In fact, the presence of this inexplicable gravesite in the backyard, slowly filling with water, created a very Rear Window effect.) Then, after it seemed to be starting to breed insects, not to mention becoming a likely death trap for skunks or other smaller mammals, Sarah filled it with sticks and branches and we all went out to jump on the branches and break them as much as possible and drive them down into the ground; and then we loaded the dirt back on top. Sarah claims it will somehow all be fertile compost in a year or two. Next Post “Racial Tone-Deafness” on “Girls”: Where’s the Black Best Friend?! ?